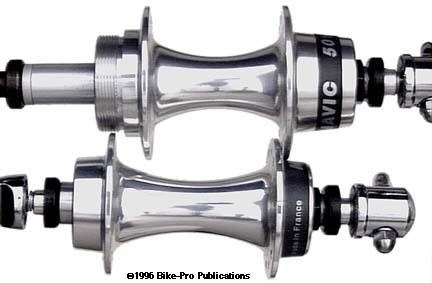 Mavic uses the same front hub for four of their present and previous pair of hubs, the 501 & 571 road hubsets also the previous 531 mountain hubs, and the discontinued 577, mountain cassette hubset. Because the front hubs of all bikes use a 100mm over lock nut axle dimension this is a practical way to cut down on the number of different hubs that would have to be made. 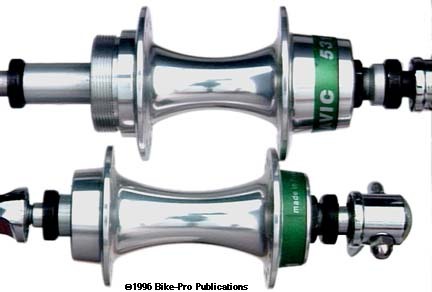 The hub shell is made of aluminum alloy then polished to remove the marks of the lathe work in making the hub round. Mavic uses precision sealed bearing cartridges that are held in place by machined aluminum lock rings. These lock rings are drilled to let the axle pass through and have six equally spaced 2.5mm holes bored in its face for a pin spanner to grip. The axle is machined from 15mm diameter aluminum rod, that is reduced to 12mm as it passes through the bearings. The 12mm diameter axle is threaded at the destination bearing, (the second bearing in contact with the axle), for a steel locknut that holds the axle in place between the two bearings. Both ends of the axle are also turned on a lathe to reduce them to the 9mm outer diameter standard used in fork ends. The aluminum axle has a groove cut 5mm from each axle end. A steel axle contact cap butts against the shoulder where the axle diameter steps up from 9mm to 12mm. The steel cap has a serrated outer face that presses against the fork end. The cap is held in place around the 9mm diameter area of the axle by compressing cir-clip. The exposed end of the steel cap grips the fork blade when compressed by the skewer. A rubber O-ring recessed around the steel locknut seals the bearing against outside contaminants. This hub is remarkably smooth in use.